Shanna and Brandon’s FEAST at Round Hill wedding was truly a smorgasbord of beauty. Everything from the water color invitations to the spectacular grounds at FEAST to the lush florals was breath taking. Yet the most beautiful thing, by a mile, was the love that Shanna and Brandon have for each other. The warm and sunny Thursday in June brought along such a feeling of expectation and joy, we were so excited when we arrived to begin photographing Shanna and Brandon’s wedding day. 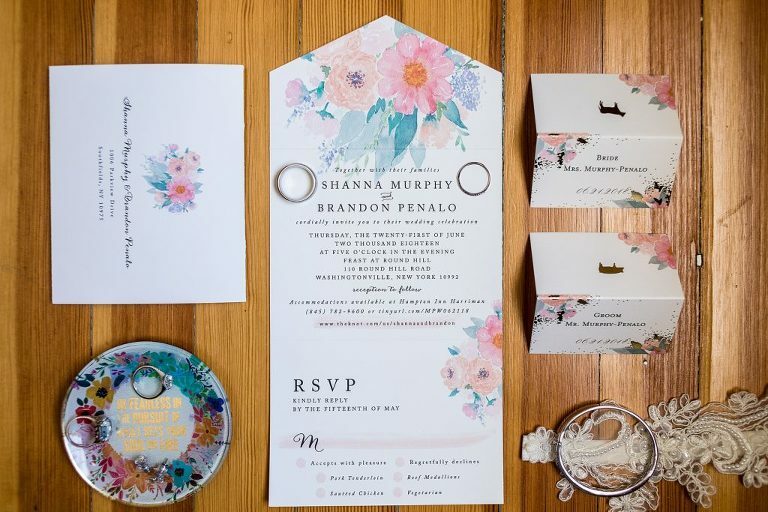 The watercolor invitation provided the perfect backdrop for the wedding rings. The textured fiber of Brandon’s ring was a trend that we have seen grow in popularity this year and we hope out continues! Shanna’s wedding dress hung neatly in the bright room. The plunging illusion neckline was dramatic and eye catching. Shanna’s style was right at the forefront of the day. A beautiful lace bridal robe gave her a feeling of effortless elegance as she reached for her stunning dress. Once she’d slipped it on, there was a knock on the door. It was her father. And he didn’t come empty handed. With a huge smile, Shanna (like Donna), beheld the necklace that the little red box contained. With an even bigger smile, her father helped her put it on. A final sip from her personalized wine cup, and she was ready to get this show on the road. Brandon, meanwhile, was busy getting himself ready to meet his bride. As a unique touch, he donned Reptar socks (holy Nickelodeon, Batman!). We loved the quirkiness this added to his wedding day ensemble which was otherwise impeccable. Watch adjusted and tie on straight, it was time. Deep within a lush garden, enveloped in sunshine, Brandon stood waiting for a gentle tap on his shoulder. The tension within him was creeping ever upward, and the moment Shanna’s hand lighted on his shoulder, he lit up. Every fiber of their beings were joined together and they embraced in the happy knowledge that they were finally together on their wedding day. Their happily ever after was underway. Wandering throughout the gardens, we were spoiled for choice for portraits. A single guitarist plucked delicate notes as Brandon stood at the top of the aisle, waiting for his bride to join him. Linked arm in arm with her dad, Shanna (like Donna) made her way down to him. 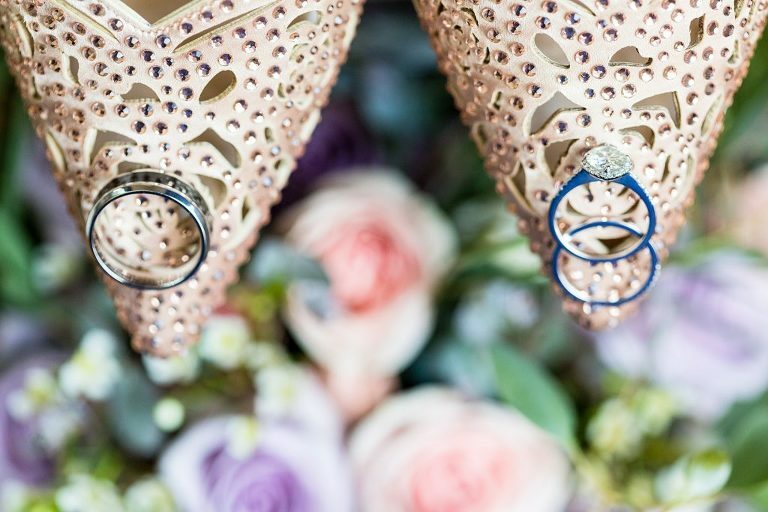 Beneath a shady tree, they exchanged their vows and rings. With a kiss and a tender hug, they were pronounced husband and wife. Their smiles beamed as they processed down the aisle together forever. The rich warm hues of FEAST at Round Hill gave Shanna and Brandon’s reception an earthy and inviting atmosphere. It was like being gathered in the great room with your best friends. The vintage chandeliers only augmented this feeling. After some of the sweetest parent dances, the floor opened up and it was off to the races. And you couldn’t pry Shanna and Brandon off the dance floor, except for some epic sunset portraits. 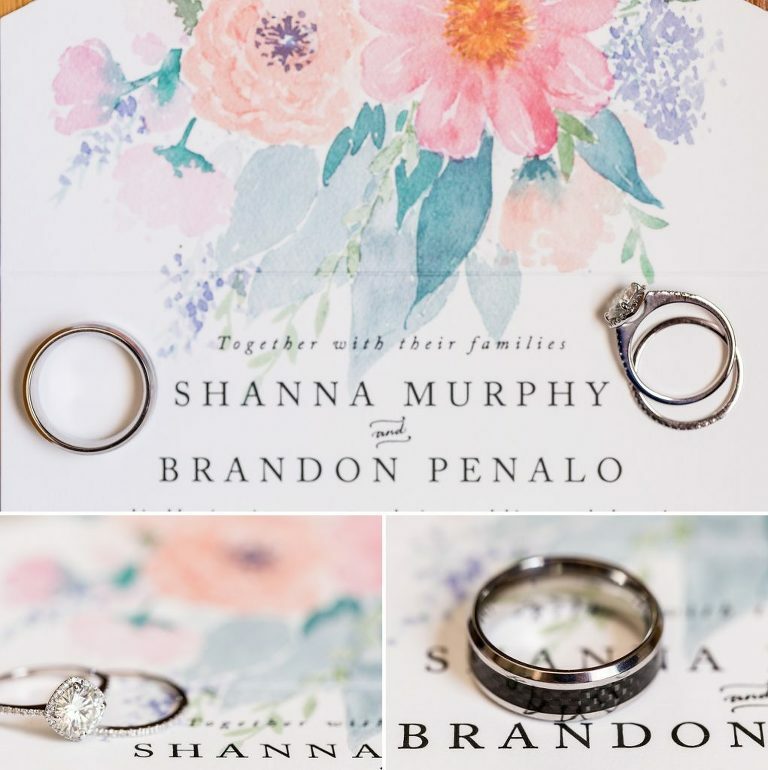 Shanna and Brandon, thank you for letting us be a part of your happily ever after!